Often times these decisions are interdependent. For example, choosing a particular market segment may eliminate certain value propositions from consideration. Choosing a particular value proposition may dictate certain technologies. For this reason, the choice of technology, market segment, value proposition and business model elements cannot be made independently. In this case, when we have to experiment to gather information or test assumptions; we need to construct feasible combinations. I was reminded of this interdependence when watching a British police show. “We are pursuing multiple lines of inquiry” is often said to deflect questions about who is under suspicion. But parallel investigation is actually occurring. Any viable suspect has to meet all three of these criteria – they are interdependent. If a suspect lacks any one of the three, they can be eliminated from consideration. But the three criteria are interdependent in other ways. The means, motive and opportunity have to be consistent. For example, in a classic murder mystery, if the motive is to inherit money, the murder must occur before the will is changed (the opportunity). Assumptions about means, motive and opportunity are made based on the collection of evidence. The evidence may support more than one theory of the crime. As more data is collected and analyzed these assumptions evolve and so do the theories. These different theories are investigated in parallel for fast resolution. It doesn’t make sense to split up the investigation by criteria: to have one team focus on evaluating all suspects on motive, another team on means and another on opportunity. Because of the interdependence, if a suspect fails on one criterion they can be eliminated. There is no need to consider the other criteria. Therefore, it makes more sense to have teams working on different theories of the crime in parallel. In order to make progress quickly it makes sense to eliminate suspects by trying to disprove the easiest criterion first. Opportunity must be the easiest to check, since everyone is asked for an alibi! Anyone without a solid alibi potentially meets the opportunity criterion and is a viable suspect to be subjected to further investigation. How does this apply to product development? 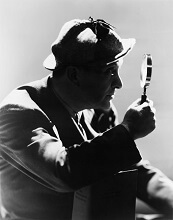 Be a detective and think of your product concepts as suspects. Viable product concepts have to pass a set of criteria, such as, commercial feasibility, technical feasibility, fit with external conditions, and fit with the business model and the business strategy. Think of these criteria as being equivalent to means, motive and opportunity. Assumptions about the market, customers, competitors, technology, etc. are made based on collecting data, or evidence, and these assumptions impact how well a product concept fits the criteria. Where we lack information and uncertainty is high, we need to investigate and experiment to find evidence to support or update these assumptions. There are many advantages to acting like a detective in product development. Speed can be attained by working in parallel while trying to reduce uncertainty and staying razor focused on the top criteria that need to be resolved for your project. This approach also helps the team to kill the project quickly (no pun intended), if any major assumptions are disproved. This allows for the optimization of your scarce resources. These principles are a big part of our approach to product development, called Exploratory PD. To learn more, download our Exploratory PD whitepaper.